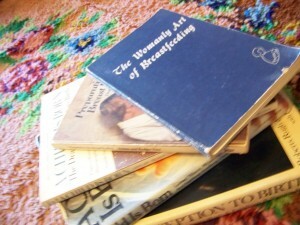 What do you do when you're beyond the breastfeeding and pregnancy books? There are many books on the market about natural or attachment parenting and babies. All of them advocate similar parent styles – birth bonding, feeding on demand, wearing the baby, and so forth. With some modifications, this style of parenting can suit many different babies – from high needs to relaxed, for children with special needs to those who have been adopted. Although every infant is different, they all want and need the same basic things. But what about the older children – not just toddlers, but those who are in school? What happens when natural parenting isn’t about starting solids, slings and BPA-free sippy cups? How do you handle the ages and stages of peers, peer pressure, media, school and – gulp! – hormones? You handle it by taking a deep breath, relaxing, and remembering that with a few simple modifications, the same basic Natural Parenting Principles apply to older children as well. Here are a few examples. 1. Prepare for the next stage: When you are waiting for your child to join your family, you probably read a lot of books. From pregnancy to birth to parenting through the first year, new parents often scour the shelves of bookstores and libraries looking for books to help them form their parenting philosophy – or simply, what newborn poop should look like and when to head to the doctor! When your infant grows into a toddler and then a school-aged child, you will want to turn to books written with natural parents in mind for tips and tricks to navigate this whole new world. 2. Feed with Love and Respect: Caregivers need to feed little babies in an age appropriate manner, hold them lovingly, and respect their cues so that they are not over or under fed. Solids are introduced as based on baby’s needs and a love for healthy foods is the goal. Just as you need to watch a baby’s cues when you feed them, you need to respect your older child’s hunger cues. While an older child can wait a short amount of time until a meal finishes cooking, they still need to eat more, and more frequently, than adults. Keep small, healthy snacks on hand and place them so they are easily accessible for your child. 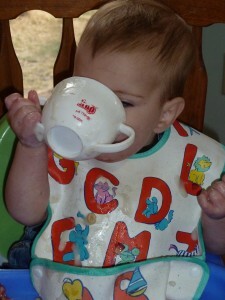 Respect your child when they tell you they are full; there is no need to be a member of the “clean plate” club! A simple way to invest children in their food is to have them cook with you. Find some kid friendly cookbooks with simple recipes and directions. You can become their helper, and they can prepare a meal or snack for the whole family! Involve them in the clean up process too. My mother was fond of telling me that good cooks clean up after themselves. Keep taking your child to the grocery store. It may be tempting to do the grocery run at night or while they are in school or other activities, but grocery shopping is a great way to introduce new foods and have discussions about “red light” and “green light” foods. While shopping with toddlers can be a trying task, I find grocery shopping with school-aged children to be much more enjoyable. They count out apples and help me discern which are the ripest. We read labels together and I teach them what “red light” words to look for (trans-fats and high fructose corn syrup are two big ones). Often, grocery shopping can be a learning experience for all of us. One day, BigBrother wanted to try the “cute little baby lettuce” (aka brussel sprouts). I bought them and now our whole family loves them! One of the hardest things about sending BigBrother off to school was the fear that his love of fruits and veggies would be corrupted by some kid with a white bread, HFCS and trans-fats laden lunch. Mini bags of chips and fried goodies can be so tempting. We’ve had to strike a balance. He does eat chips, soda and goodies with his friends, but he eats far less than I would have thought. I make it a point to serve healthy foods at home where he eats most of his meals. There is a treat in his lunch but he knows that cookies and candies are just that – treats. I try to teach him to have a balance with his food. There’s nothing wrong with cake and ice cream at a party, but it is not an everyday food. Finally, if you do nothing else, sit down for a meal together. There is increasing evidence that shows family meals are an important part of strong, healthy children and families. You don’t have to be a gourmet cook and dinner can simply be cold cereal, but sit down and enjoy each other. Ask your kids about their day and really listen to their answers. Discuss local news, sports and politics and have everyone’s opinions matter. Need a conversation starter? Laurie David of The Family Dinner has some wonderful ideas for “table talk.” My Herd likes to play “best and worst.” We go around the table and each family member tells the best and worst things that happened that day. We’ve learned some interesting things about our children this way! A love of healthy food begins young . . . and continues throughout life. The “big kid” stage can be scary and intimidating for some . . . stay tuned for more tips on staying connected with your naturally parented child. Interesting post!! I really like this site, and hope you will write more. great post – i really like the ‘best and worst’ discussion – my 2 boys always like to find 10 minutes in the evening for a chat about their day. it works like a debriefing and they can get any worries off their chests plus i get to find out stuff thats going on! !